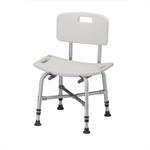 The Invacare Mariner Rehab Shower Chair with 18" seat width features an all aluminum frame and stainless steel hardware, making it completely rust-resistant and ideal for use in the shower. 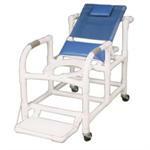 It is lightweight, durable, and folds easily for transport or storage. This chair fits over most standard and elongated bowls for over-the-toilet use. This chair has a 300lbs weight capacity. 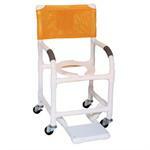 Back Height: Top of seat to upholstery top: 15-1/2"
Footrest: From top of seat: min. 13", max. 18"
Overall Width: Open: 26-1/2" (hand rim to hand rim) Folded: 12"
Clearance: Front crossbrace to back edge of rear tire: 26-1/2"
Rear-wheel axle bolt to tire edge: 11-1/2"
Floor to seat base: 20-1/4"
Inside width (between side frames): 16"